Metro Method: Revenge of the Nerds! Nerd Swagger: tipping past the brink of not giving a damn about being cool, to the point that you're hot. 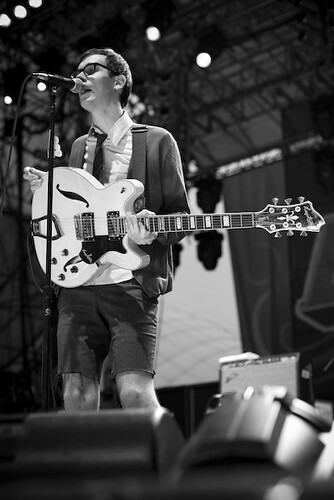 As an example of this, consider Forrest Kline- the lead singer of Hellogoodbye. Here's a man who's so out, he's in, and women LOVE it. Don't believe me? Here's a sample of some of the comments he's gotten off of youtube. he's such a damn hot nerd! i want to marry him one day. So freakin nerd! So freakin hot! Admittedly, a lot of what makes him so desireable lies more in his attitude than his wardrobe. However consider the inverse; could you picture Forrest Kline in a pair of Ecko sneakers, Sean John jeans, and a LRG shirt? I think not. Moving past the stardom example of Forrest Kline, let's now take a closer look into what goes into pulling off that elusive nerdy look, and why it's so attractive. We'll begin with repetition of design: what patterns have shown up in the style consistently and what period(s) do they date back to? Plaid, historically known as tartan, has a rich background and is deeply rooted in the Hallstatt culture. The checkered and striped pattern was not thought to have existed before the 16th century in Scotland and was then used to delineate between different regions and populaces of the Country. Highlanders would wear multiple tartan patterns into battle and the design was long considered Jacobian by nature. In 1822 visit of King George IV to Scotland rekindled the demand for tartan cloth and made it the national dress of the whole of Scotland rather than just the highlands and islands, with the invention of many new clan-specific tartans to suit. Of relevant note, Argyle is a form of tartan derived from Clan Campbell in western Scotland. Plaids have literally been revolutionary clothing, a symbol of protest against the norm. Today, where conformity is thought of as passé, it's no coincidence that this style has continued to remain edgy and eye catching. In the 19th and early 20th centuries in the United States and much of Europe, shorts were worn as outerwear only by young boys until they reached a certain height or maturity. As they matured, the boys would receive their first pair of long trousers. This produced the perception that shorts were only for young boys. Because of this, men avoid wearing shorts, for fear of looking immature. Looking immature, never growing up, and never having to be a dull boring adult? Hell yea I could go for that! Short-shorts hold their own form of wildness and rebelliousness, not the Hugh Jackman kind of wildness, but attractive none the less. The bow tie originated among Croatian mercenaries during the Prussian wars of the 17th century: the Croats used a scarf around the neck to hold together the opening of their shirts. This was soon adopted (under the name cravat, derived from the French for "Croat") by the upper classes in France, then a leader in fashion, and flourished in the 18th and 19th centuries. HO HUM! Another example of battle born attire! Imagine that. So let's recap, what we consider as 'nerdy' has either historically been battle attire for some of the most fearsome warriors history has every produced, or a manifestation of the need we all have to want to remain youthful and free from the burdens of the world maturity thrusts upon us, or visa versa. Nerd swagger has my 100% approval as being Metro ready and I encourage you all to give it a whirl.